If you make homemade custard-base ice cream and have egg whites leftover, this is ideal! I hardly need ways to use up extra egg whites; I like bulking up my morning egg sandwiches with an extra white, and I absolutely love using them to make financiers, or French tea cakes made with ground almonds and brown butter. So I actually had to plan ahead and save a couple of egg whites for this project, another reason I went with these smaller versions. I used 2 egg whites. 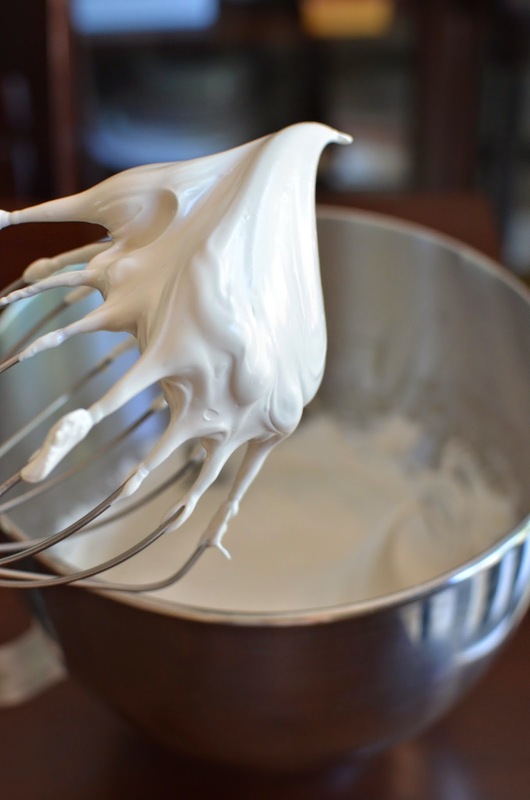 The recipe uses the swiss meringue method - you start by first whisking the whites and sugar over a pot of simmering water before transferring it to a stand mixer to continue to stiff peaks. This is intended to help build volume and stabilize the whites. I always think of a little vinegar in pavlovas to help create that chewiness within but this recipe for chocolate pavlova uses dark brown sugar and a little cocoa powder for that affect. Spread the meringue onto parchment paper where you've drawn circles with pencil on the underside to guide you. Make a bit of an indentation in the center and try to resist over-working it so you don't deflate the whites too much. I have a suspicion I over-work my meringues more than I realize. For thicker pavlovas, I would make 2 instead of 3 rounds. I really stretched to make three 4-inch rounds here. The mounds look pleasantly abundant going into the oven but once I took them out, I was reminded by how much they spread after baking! Bake the pavlovas in a 300 degree oven until they are dry to the touch, roughly 40-45 minutes. As you can see, once they're done, I had a saucer or plate-like disc for my ice cream. They spread to about 4 1/2 inches after baking. Next time around, I think a thicker pavlova would give a better contrast in texture between crisp edges and chewy center. As I mentioned, mine were rather hard around the edges though the center was chewy (and I definitely like chewy). The fun part comes with adding the ice cream and serving it up! I topped one with homemade vanilla bean ice cream (and some fudge sauce), and the others with store-bought coffee chocolate-chip and neapolitan ice creams. We just dug in and made a mess of ourselves! Here's to summer and lots and lots of ice cream treats, in all the ways you like to enjoy it! Preheat oven to 300 degrees. On a piece of parchment paper, draw three 4-inch rounds, spacing them about two inches apart. Line baking sheet with the parchment paper, pencil marking side down. Place egg white, sugars, and salt into the bowl of a stand mixer set over a pan of simmering water. Whisk constantly until sugars dissolve and mixture has thickened and feels warm, about 3 minutes. Remove from the heat, attach the bowl to the mixer, and whisk on medium-high speed until stiff, glossy peaks form, about 6 minutes. Beat in the vanilla. Sift cocoa powder over the meringue and gently fold until just incorporated. Take a large spoon and place dollops onto the parchment paper on top of the drawn circles. Gently spread the meringue using the drawn circles as a guide. Lightly flatten the center to create a well in the middle. Avoid over-working the meringue or spreading the meringue too thin. Bake meringue until dry to the touch, about 40-45 minutes. They will spread a bit during baking. Let cool on baking sheet set over a wire rack. Once cooled, remove from parchment paper. They can be stored, covered, for 1 day. Otherwise, place pavlova on plates and top with scoops of your preferred ice cream. Frozen treats galore is definitely the best part about summer!! Especilly when they look this nice! I've never made or even eaten a pavlova, but they sound super delish! And yours came out beautifully anyway! Flatter or not, I'm sure they're super delish! I really got that "plate" or "sauce" I was thinking of when I started this! haha. Thanks and you stay cool, Consuelo. These are so pretty, Monica! And they sound soooo good! These pavlovas are so gorgeous. I love how you topped them with ice cream! I have never ever made a pavlova before. They look wonderful and I love the big scoop of ice cream. I have tons of recipes I have ripped out from magazines and it sometimes takes me 5 years or more to make them. I love those gorgeous chocolate pavlova with ice cream, Monica. A perfect summer treat. Oh my! This looks amazingly delicious! I am allll about the frozen treats right now and with the chocolate pavlovas??? I need to be better about trying recipes that I mark in magazines, etc. I have some that have been sitting for years as well! This is really a showstopper Monica, perfect for entertaining! It's fun to take something simple and put a little spin on it. I actually have some egg whites in the fridge right now that need to be used up...and plans to make ice cream today! I see chocolate pavlova nests in my near future. Less gorgeous?! Forget about Martha, yours looks fantastic, Monica! Great job. I've only had pavlovas a few times at restaurants. This chocolate pavlova looks delicious with the ice cream! Thanks, Nami. Hope you're having a great weekend! Simply lovely and elegant dessert!!! These pavlovas are gorgeous! I have never made them before and yours looks so delicious with the scoop of ice cream and drizzled fudge sauce! I still have recipes from really old magazines that I have been meaning to make and you are inspiring me to get on it :) Hope you had a wonderful weekend, Monica! haha - I have so many recipes that I ripped from magazines or have "saved" to try...I doubt I'll ever get to most of them but sometimes it's fun to pull one out and try. :) Hope you had a good weekend...ours was very productive. These look great, Monica! The crunch of pavlova with ice cream sounds perfect. Do you think you could use two thin pavlovas and make an ice cream sandwich or would it be too messy? It sounds really good to me. I stopped getting magazines because the backlog of saved recipes was making me look like a hoarder! Now I pin recipes online, instead. But being old school, I often print them out. Then I am back to where I started with piles of recipes! I do pin recipes as well these days but can't resist the print stuff either!